Bring a large pot of salted water to a boil over high heat. Add the pasta and cook until tender but still firm to the bite, stirring occasionally, about 8 to 10 minutes. Drain pasta reserving 1-2 cups of the cooking liquid. In a large, heavy skillet warm the olive oil over medium-high heat. Add the sausage. Using a wooden spoon break up the sausage into bite-sized pieces as it browns. Continue cooking until the sausage is golden brown and cooked through. Add the spinach and let it cook down for a few minutes. 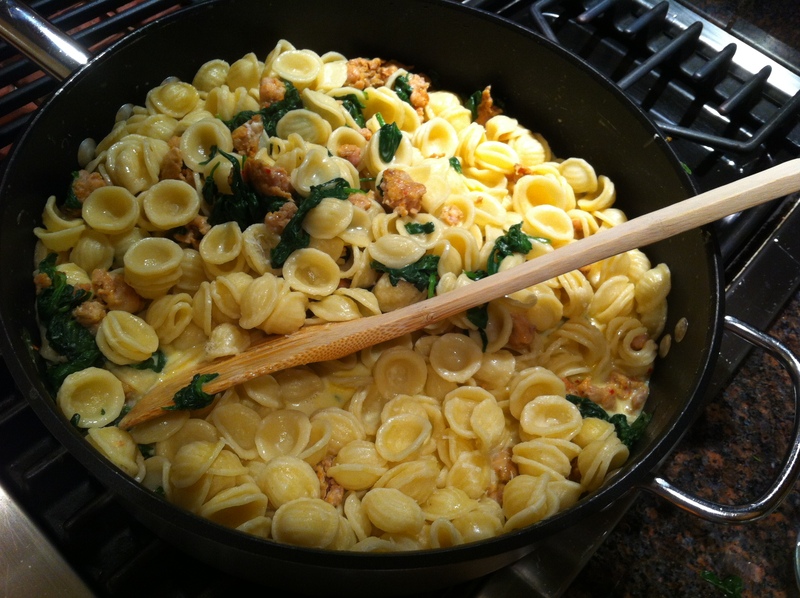 Add 1-2 cups of the pasta cooking liquid and stir, scrapping up any brown bits from the bottom of the pan. Add the mascarpone cheese and stir until it dissolves into a light sauce. Add the parmesan cheese, salt, pepper, and hot pasta. Stir until the pasta is coated and serve.